It's been absolutely no secret that a few of the members of NEMESIS and I have had personal disagreements in the past. Nobody was as well-behaved as they should have been, and I think we can all agree to that. Recently, I joined NEMESIS with my alt account, renamed Trenbolone. Knowledgeable people, or anyone who Googles that name, would instantly know my identity. I didn't try very hard to hide it. Nonetheless, VALORIUS invited me to join his clan. Whether or not he knew who I was at the time is beside the point -- interpersonal interactions thereafter were actually very cordial. To me, this just showed that when our identities are obscured, we have little reason to treat each other poorly. We may still dislike each other, but that does not mean we should make each others' gameplay any less enjoyable by hurling insults and other useless vitriol. I am and have been aware VALORIUS knows who I am and is expecting to be able to glean some information from me, whatever information he thinks I am somehow privy to. 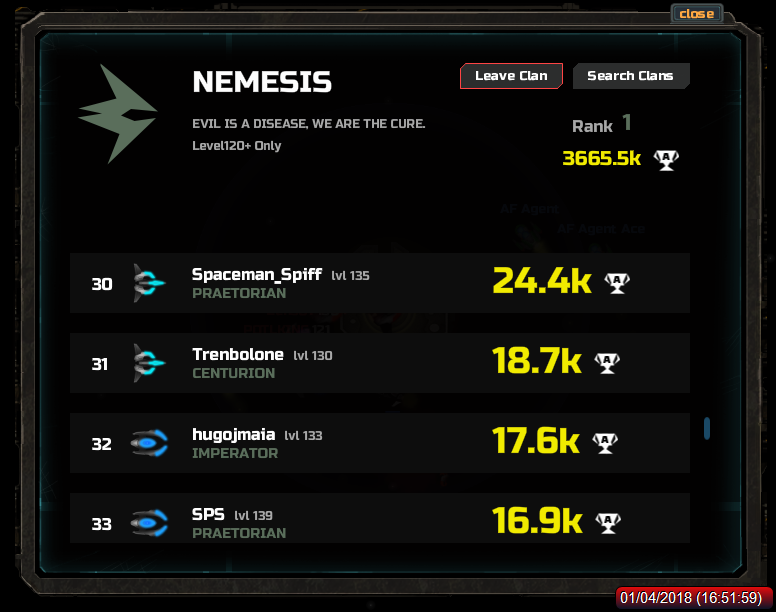 As it stands, I am enjoying my time in NEMESIS, and I would like to continue being a member should they find this amenable. He knew it was you the whole time. Chris22 wrote: He knew it was you the whole time. At least val is following his values, which is comforting I suppose. I was indeed manipulating the situation, to determine what boogerito's purposes were....but also, once more, to see if i could trust traf. As i told several top NEMESIS members at the time boogerito joined, i'll let him stay and see what his intentions are...maybe he'll be loyal to the clan, in which case....awesome for us. So long as that is his intention, he is welcome in our clan. There is no doubt whatsoever that he makes us stronger. I haven't played since the year started, so I haven't even paid attention to what happened ingame these past 2 weeks. Either way, I have nothing against you, but I think your main account is a massive killjoy to fight against. Val, the second you told me you knew who he was I knew you were “testing” me. You’ve done the exact same thing before with other moderators. Like I said, at least you follow your own precedent. 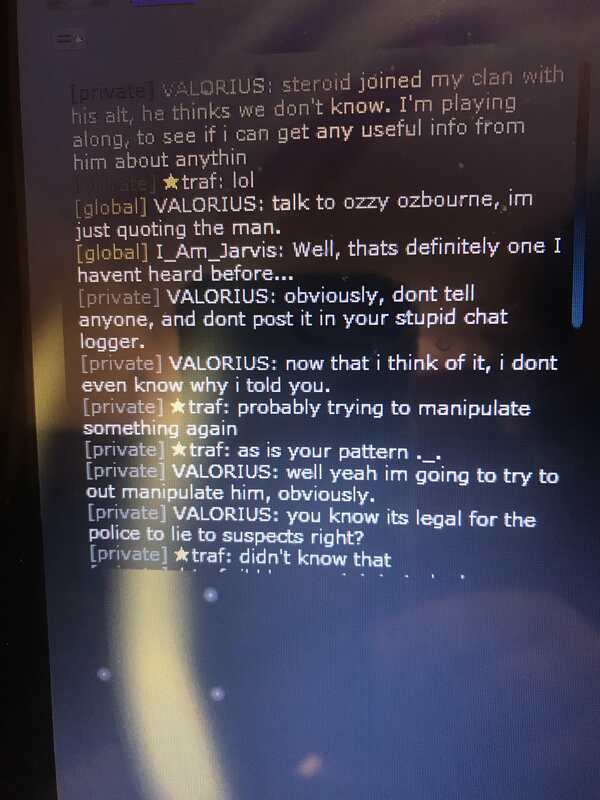 Proof I knew: in that very screen, I said val was probably trying to manipulate something by telling me. Which he was, because of course he was. I sent that screen to Swole to warn him. I figured he was smart enough to know Valorius would try to milk him for whatever Val thought he knew, but I felt like telling him anyway. Why? Because I honestly don’t care if val trusts me. I already don’t trust him whatsoever. I gave Swole the green light for him to use that screen, and I thank him for asking before posting it. And why don’t I trust val whatsoever? Mainly because of your worldview. You think of yourself as the “bad cop”, willing to lie and attempt to manipulate people in order to gain “confessions” or what you think is proof someone hacked, or whatever information you care to chase after. However, every time someone says something to you, and you send it to us, I have absolutely no idea whether it’s someone telling the truth or someone trying to troll Valorius. I cannot tell you how much of my time has been wasted (and how much sleep has been lost) chasing what you think are leads, or trying to convince you that your interpretation of a message is not the only valid interpretation. I remember talking with you for multiple hours in circles with bpete and/or nocturne, I don’t remember who else was there now. I oughta see if I can find some old screens or log files of our conversations . . . might be worth a giggle or two. And no, I don’t really care too much how many “hackers” you’ve “caught” in the past, even though i’m sure you’ll feel the need to bring it up again. I care about what methods are used to gather information, what evidence is actually available and provable, and proper exegesis of text. And yes, i’m aware you think i’m using the word “exegesis” wrong. I assure you I am using it correctly. I probably have more to say, but I have a life to attend to. I look forward to watching the impending hyperventilation and generalized “angst”. And mt10, when did you learn that you can’t trust me? I’d love an example. Private message the global moderator group if you’d rather not discuss it in public, although i seriously doubt it’s something I would mind talking about publicly. People got so bored with the actual game that they started playing mind games instead.